If you have ever entered an airport with any child, let alone one with special needs, you will know the stress and anxiety the whole experience can bring. One bad experience can put us off travelling overseas ever again so we either stay-cation or don't bother having a holiday at all. Today, the team who produce the Heathrow Airport guide are kindly sharing their top tips and advice for families who are travelling with children needing special assistance. Let us know, in the comments, what other tips you have. What has worked for you? With new rules and regulations such as the Disabled Air Passengers’ Rights Regulation coming into effect in recent years, flying with a child needing extra assistance should be a whole lot easier than before. Not only have most UK airports improved their facilities specifically aimed at helping special assistance passengers, they have also revamped their entertainment amenities, such as lounges and play rooms to keep your kids occupied for what can seem like an eternity whilst you wait for your flight. So what have the main UK airports specifically done? Heathrow started off by improving their travel services that go directly to and around the airport. This included a major rehaul for the Heathrow Express, its platforms were made level with the trains, unaided wheelchair access was granted, as were accessible toilets and illuminated buttons with Audible signals were added. Should you arrive at the wrong terminal with your child for one reason or another, or are on a connecting flight, don’t panic, Heathrow recently decided to implement a special assistance bus which helps special assistance passengers move from terminal to terminal should they need it. Just ask a member of staff about the bus or find a special assistance point and in most cases the bus will arrive at the terminal forecourt for you. Heathrow also had major redevelopments in each of the terminals to make journeying through the airport with a special assistance child that little bit easier. These improvements included more special assistance points being scattered around each of the terminals, wider access paths/ramps, more disabled toilet facilities and reserved seating for special assistance passengers can be found at check in areas. 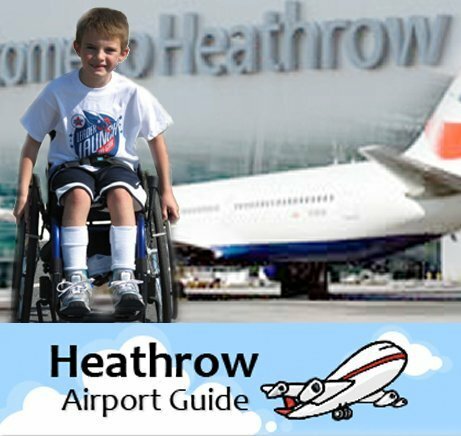 For more information about special assistance at Heathrow, check out the Heathrow Airport Guide. Gatwick Airport seem to offer a more flexible service for special assistance passengers, whilst they have added more facilities such as PRM only areas in departure rooms and assistance lanes which should help speed up your journey through the airport and avoid being held up by other passengers. It is recommended by Gatwick Airport that special assistance passengers or their parents/guardians contact the airline company of their choice 48 hours before the flight to ensure that you can get the services you require. It’s also worth mentioning that Travel Care, a charitable organisation specialising in providing assistance to special assistance passengers, have partnered with Gatwick Airport and can be found in the South Terminal. For more information on special assistance at Gatwick Airport, check out the Gatwick Airport Guide. Along with redeveloping their special assistance facilities, both Heathrow and Gatwick have invested huge amounts of money in their airport lounges and children’s entertainment. After striking deals with the likes of No 1 Traveller and Servisair, the airports have been able to incorporate children’s entertainment into the airport lounges. The lounges include colourful family rooms with TVs to air children’s programmes such as Bob the Builder, whilst making you feel at home with beanbags and other comfy chairs. The prices for these lounges vary but you will be looking at spending between £10 and £15 for a child’s ticket, whilst the cheapest adult ticket is around £18. In addition to the airport lounges, both airports also have children’s play areas, built to keep your little ones occupied prior to the flight. Unfortunately they are unsupervised, so you will have to keep your eyes on them at all times. These play areas can be found in each terminal. If you haven’t made them aware of your needs at least 48 hours before the flight. There are a few safety rules that could prevent you from flying - for example, if you’re flying alone when really you need someone to help you move around. Although it may seem harsh, if the airlines doors are too small, then again, they can cancel your flight with them. However in most cases you will either be refunded or moved to a different plane. Even though a decent airline is expected to assist you and provide a quality service, there are no laws stating that they must. Members of the airline staff do not have to provide you with personal care, but they do have a duty to get you to the toilet before and during your flight. Airlines do however need to allow you to bring two mobility items on board the plane; if you need more then these should be checked in and confirmed with the airline. It is recommended that you get insurance to cover these pieces of equipment, as airlines are not obliged to compensate you should the equipment get damaged. When getting off the plane, your mobility equipment should be made available to you as quickly as possible and if your equipment has been damaged, then the airport or airline must provide you with replacements. You are also entitled to help when reclaiming your baggage. If you feel that you have been unfairly treated at the airport or during your flight then you may want to make a complaint. The best way to do this is to complain directly with the airline or airport. Hopefully the problem will be sorted out by them, but if this isn’t the case then you can complain to the Civil Aviation Authority (CAA). Liquids are essential! Always have something for your children to drink. Be careful with sharp items, some well organised parents will carry a small pair of scissors to open things such as milk cartons, but you should check if these are endorsed by your airline. Food! Always have snacks and nibbles for your children, food keeps everyone quiet! Entertainment is vital, you need entertainment during long journeys right? You don’t want your children having a meltdown on the plane so be prepared, things like picture books, portable DVDs and small toys are great. What else? What tips do you have for other parents considering travelling overseas? What has worked for you at the airport? What did you do in preparation?